National Healthy Bones Week is back in 2012 to encourage Australians of all ages to team dairy intake with exercise for positive bone health. Established by Dairy Australia in 1994, National Healthy Bones Week (NHBW) is a health promotion initiative that aims to educate Australians about the importance of calcium-rich foods, such as dairy. NHBW also highlights dairy's key role in building and maintaining strong healthy bones to help prevent the development of osteoporosis later in life. A new study undertaken by researchers from the University of South Australia investigated the health benefits of dairy consumption and also calculated the healthcare expenditure in Australia due to low dairy consumption. They calculated that at least 43,000 cases of could have been prevented if Australians increased their dairy intake, saving the national healthcare system some AUD112 million, according to a new study. However, new research published in the Australian and New Zealand Journal of Public Health has shown most Australians are missing out on dairy's bone boosting benefits with 73 per cent of women and 58 per cent of men failing to consume their minimum recommended intake. The situation is worse for teenagers with 62 per cent of boys and 83 per cent of girls failing to have the recommended three serves of dairy foods daily. On average Australians are only consuming 1.7 serves of dairy foods per day, much lower than the recommended three serves per day. A serve is equal to 250ml milk, 200g yogurt or 40g cheese. Increasing dairy intake to even two serves a day could significantly reduce the number of Australians who develop osteoporosis each year. NHBW which runs from 19 to 25 August this year will give Australia a calcium boost with 'Free Shake Days'. The highlight is the time-honoured, classic calcium booster – the milkshake! More than just a simple and tasty way to boost bone strength, milkshakes conjure up fond memories of childhood, the local milk bar, first dates, warm summer nights and fun with friends. Dairy Australia dietician Glenys Zucco commented that National Healthy Bones Week is a timely reminder to take care of our bones and this year's 'Milkshake' theme encourages Australians to build and maintain strong bones by teaming exercise with calcium-rich foods such as milk and dairy products. To celebrate the NHBW's 'Free Shake Days', Café Giulia and Annex Expresso Bar have jumped on the calcium-loving bandwagon and are helping the public get their daily serve of calcium with free milkshakes and smoothies in Sydney. Located in a renovated 100 year old corner butcher shop in Chippendale, with its original unique tile work, Café Giulia has been a no-fuss, homely diner to many locals and students over the years. This buzzing neighbourhood café is popular for its coffee, warm ambience and the comfort of its breakfast and lunch menu. As a local establishment known for the freshness of its food and juices by many regular customers, Owner Stefan Stavropoulos shared with me that he wanted to give something back to the neighbourhood and Sydney. NHBW and its "Free Shake Days" provide an ideal opportunity for Stefan and his team to help spread the word on healthy diets and caring for the bones beyond his own diners. Annex Espresso Bar at Clarence Street essentially provides food and drinks that are a healthy alternative to the usual food offered by other cafes, all within a clean, well lit and designed area for diners to eat, meet and work. Owner Dieter Steinbusch shared with me his philosophy of healthy eating and healthy living which transcends into Annex's fresh and wholesome food and drinks. He believes in using ingredients that give you energy and fill you up as opposed to making you tired afterwards due to their high sugar content. His coffee is also his own blend, roasted by The Coffee Roaster. Dieter is supporting NHBW's "Free Shake Day" because it falls in line with his philosophy and hopefully will also introduce more people to the healthy eating he is trying to encourage and provide. During NHBW, adults and kids of all ages can head down to these participating cafés in Sydney and pick up a delicious free shake and calcium boost. Further updates and information for participating cafés are available on the NHBW website. Resources are also available on the NHBW website including tips and information on ways to improve and maintain bone health, delicious calcium-rich recipes and calcium meal planners for all age groups, as well as great competitions and resources for schools. Time to get yourself a Free Shake in Sydney! Why? National Healthy Bones Week (NHBW) is back in 2012 to encourage Australians of all ages to team dairy intake with exercise for positive bone health with Free Milkshakes! So get yourself a Shake now at participating cafes in Sydney. 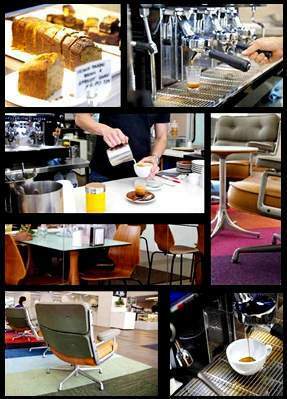 Wow, one cafe in the city and one in Chippendale. That should certainly cover 99% of Sydney children. What a flop. The Annex Espresso Bar is closed on 19 August afternoon!! I make a wasteful trip there!!! !